(VEN) - To deal with the growing environmental pollution issue at craft villages in Hanoi, a program to control upstream environmental pollution caused by industry and craft villages in the city through a cleaner production action plan has been initially implemented. Kim Lan pottery village in Gia Lam District has been selected as a pilot model. Located opposite Bat Trang pottery village over the Bac Hung Hai channel, Kim Lan pottery village has a long development history and about 300 local households are still live on pottery production. Pottery products of the village are widely sold in the domestic market and for export. However, most of the discharged waste from pottery kilns including fumes, coal residues, failed products and moulds and wastewater have caused serious environmental pollution and affected the health of local community. To control environmental pollution from upstream phase, the Hanoi Energy Conservation Centre (ECC Hanoi) provided assessments and consultancy on cleaner production and implemented a pilot model in Kim Lan pottery village to help raise cleaner production awareness for the local households. As for other solutions which have low investment costs, the consultants of ECC Hanoi consulted and guided laborers ways to fix minor breakdowns of equipment and machinery as well as regular maintenance works. The consultant group also introduced and instructed the facility owner the 5S management method of Japan (Finishing, consolidation, cleaning, clean and literacy). In general, production facility owners can rearrange production process, equipment, means and materials of production in suitable and convenient ways to save time and labor effort. Particularly, the production zones are always cleaned and the equipment, machinery are always maintained and checked before using for production phases. Regarding solutions which have high investment costs, for example, Dao Viet Binh’s facility decided to change the traditional coal burned pottery kiln to the gas burned pottery kiln model with total investment of VND300 million. 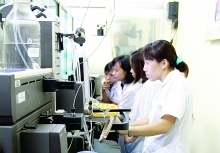 The Hanoi’s Department of Industry and Trade also supported VND90 million, equal to 30 percent of investment costs. The new production technology proved high economic efficiency while reducing emissions and decreasing the rate of failed products from 20 to 2-5 percent. The workers’ working environment has also been improved with higher production efficiency and better product quality. According to the Kim Lan Pottery Association, the shift from coal burned to gas burned pottery kilns is an effective solution. Fifty six households out of 300 households making pottery products have applied the new technology. The commune has also planned a production zone on 4.9ha, prepared to build a gas burned pottery kiln and a center to introduce the craft village, contributing to advertising products, creating jobs and guaranteeing economic-environment benefits and health of the local residents. From then on, Kim Lan Pottery with higher quality will gradually win consumers’ trust./.